With the story of Michael “Eddie” Edwards being a little before my time, my exposure to this biopic’s topic was limited to a brief mention on Question of Sport many years ago. Sue Barker had only revealed the ending, so I went into Eddie the Eagle knowing very little about the rest of the plot. Coupled with me being a total sucker for underdog movies, especially sporting ones, I was really looking forward to this weekend's cinema visit. "Yes, there’s nothing groundbreaking here, but I think Eddie the Eagle’s wholehearted embracement of the predictable underdog story traits is what makes this movie such an enjoyable watch." 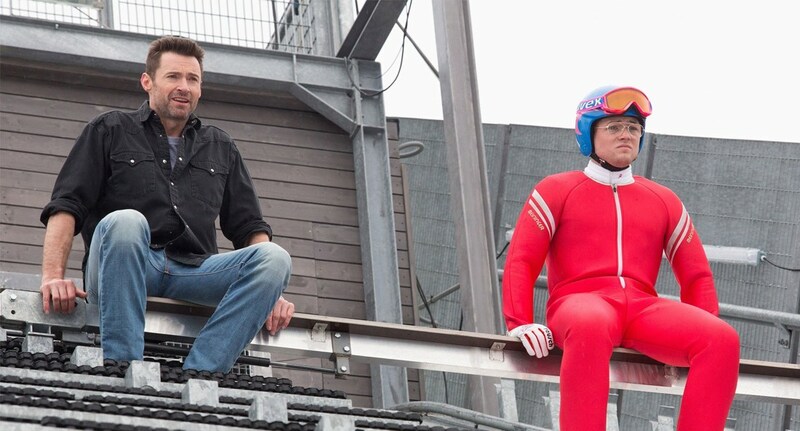 Taron Egerton stars as Eddie, and produces a fantastic performance, perfecting the distinct but tricky characteristics of the plasterer turned ski jumper. For most of us, Egerton would have come to light in the excellent Kingsman: The Secret Service in 2014. With starring roles in the upcoming Billionaire Boys Club and Robin Hood: Origins (yeah, another one), alongside a Kingsman sequel, Egerton looks like he’ll be continuing to build his name as one of the UK’s best upcoming actors. The rest of the cast also impress in a laughably predictable character selection; Hugh Jackman as the washed up coach with a booze problem — formerly a world class ski jumper and now looking for redemption. Jo Hartley (This Is England) as the supportive mum, Keith Allen (The Others) as the doubtful working-class dad with a softer underbelly, and a small cameo-like role for Christopher Walken. The uninventive character collection follows on from nearly every aspect of this movie being an underdog story cliché. It embraces the common corniness of these stories, and wallows in it to the extent it becomes charming, if you’re the sort of person who can stomach it. The part of the plot that follows the real life story naturally oozes this already, so it made sense for director Dexter Fletcher to build upon this. We follow Eddie from a young age, witnessing his childhood goal to one day become an Olympian. We also see his introduction to downhill skiing, numerous rejection, and then his adoption of ski jumping. Finally, there’s his appearance at the Winter Olympics of 1988 in Calgary where he actually made his name. Scattered throughout, there’s a few training montages with Bronson Peary (Hugh Jackman’s fictional character), many more slo-mo scenes, and a soundtrack featuring both Van Halen’s Jump and Daryl Hall & John Oates — incase you were wondering where all that corn came from. Yes, there’s nothing groundbreaking here, but I think Eddie the Eagle’s wholehearted embracement of the predictable underdog story traits is what makes this movie such an enjoyable watch. If you wince easily at a mushy, sentimental story, it may not be for you, otherwise I can only recommend. A proper heart-warmer.